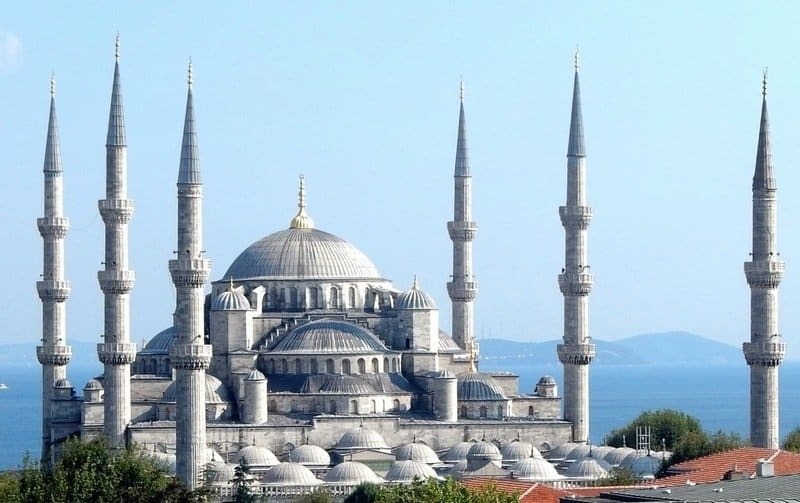 The Blue Mosque in Istanbul, or to give it its official name Sultan Ahmet Camii, is both a place of worship and a major tourist attraction receiving four to five million visitors every year. Facing the Hippodrome in the centre of Old Istanbul, its grey cascading domes and six minarets are one of Istanbul’s iconic views, the interior is just as stunning. 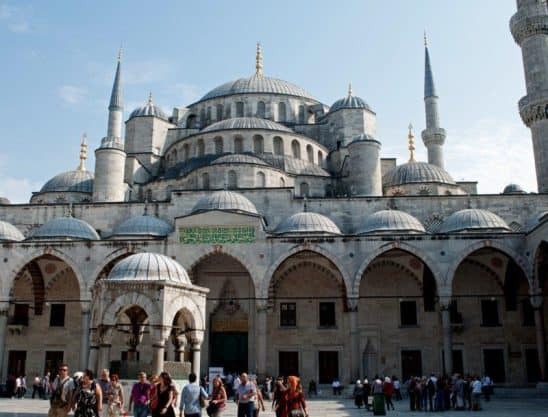 This was my first visit to Istanbul and Sultan Ahmet Camii was high on my must-see list along with Hagia Sophia Mosque and The Basilica Cistern. Since they’re all in close proximity in the Sulthanamet this is the perfect place to start exploring the city. Sultan Ahmet 1 became the 14th emperor of the Ottoman Empire in 1609 at the age of 13. 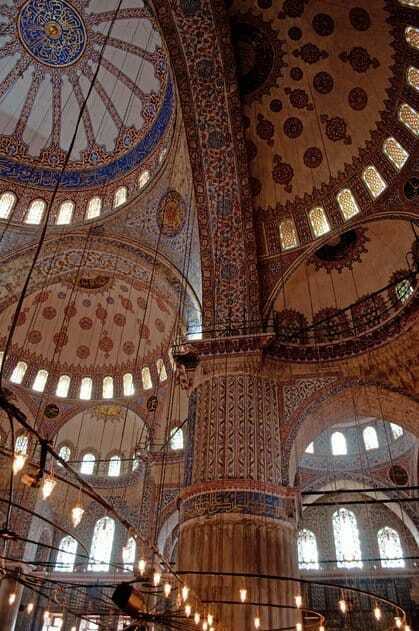 In a sort of mosque face off he ordered the building of a new mosque to rival the nearby Hagia Sophia. 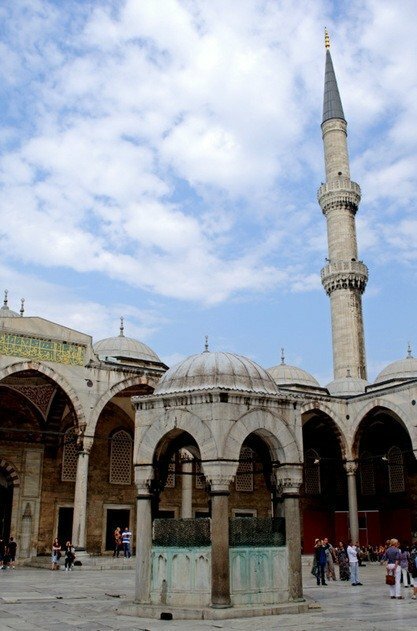 The Sultan demanded the mosque have ‘altin minaret’ or gold minarets. 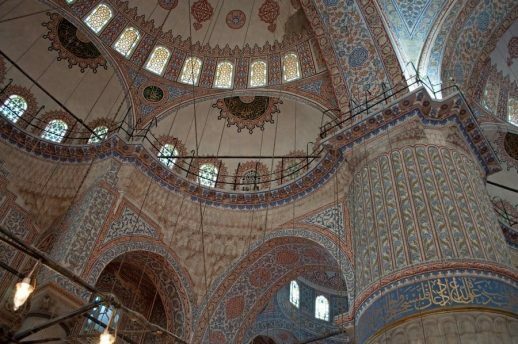 His architect misunderstood and built the mosque with ‘alti minaret’ – six minarets instead. The only other mosque in the world with as many minarets was the Haram Mosque of Mecca. The religious leaders of the time were so outraged that the Sultan sent his architect to Mecca to build a seventh minaret so that the holiest of mosques could retain its superior status. We approach the mosque from the West side near the Hippodrome for our first, close-up, glimpse. This is the best place to appreciate the mosque’s perfect proportions rather than from Sultanahmet Park. A step through the tall wooden gates and into the large square courtyard and we’re face to face with the spectacular dove-grey domes, marble walls and gold-tipped minarets. At this point most people just stop and stare and the courtyard is busy with people gazing upwards in awe. 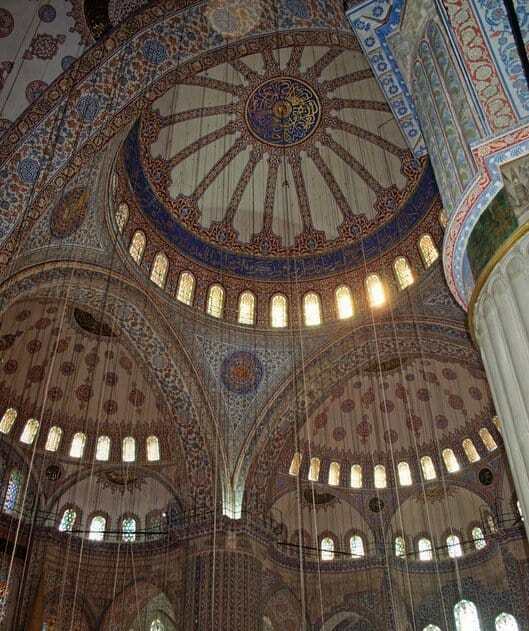 The mosque is beautiful with its gently curved domes appearing to bubble upwards. We stay for half an hour exploring the courtyard enjoying the beautifully ornate cloisters and the views of the domes. To enter the mosque itself we exit the courtyard and head around the outside to the south door which is for tourists. 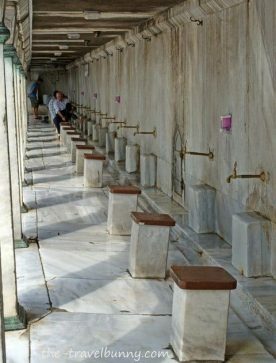 This also helps the prayer part of the mosque retain its sacred air. Worshippers enter through the main door after using the ablutions area. As the mosque is a place of worship dress code is strict. Before we could enter I made sure my legs, head and shoulders were covered. We also took socks with us as shoes had to be placed in plastic bags before we could enter. 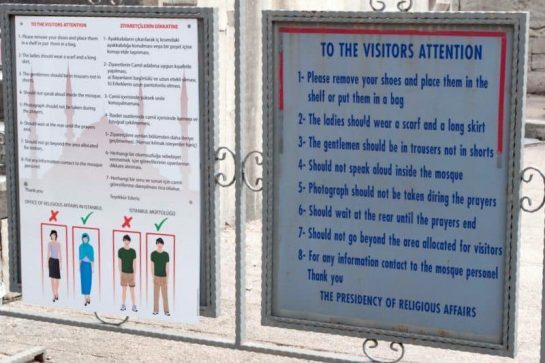 Recently officials have become stricter and now there are more stringent checks to ensure that visitors dress appropriately. Robes are handed out to under-dressed tourists so if you don’t want to wear one of these don’t dress inappropriately. I visited again in 2014 and despite being covered I was still handed a robe to put on over my clothes. Inside the mosque is cool and we notice an air of hushed calm as visitors become aware of the beauty inside. A lone worshipper immersed in prayer kneels on the deep red carpet. 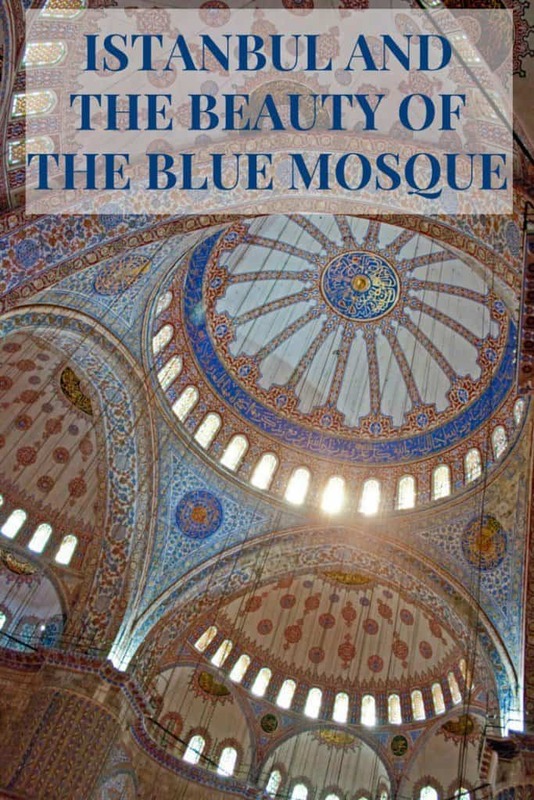 The building is a work of art and earned the moniker’ Blue Mosque’ because of it’s ornate decoration. 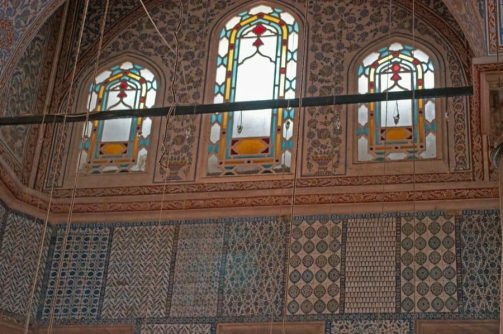 More than 20,000 blue Iznik tiles in traditional Ottoman patterns adorn the walls and ceilings. Lilies, carnations and tulips are depicted throughout. We were able to see some of the tiles from the ground floor although the majority are on the upper levels and out of sight. 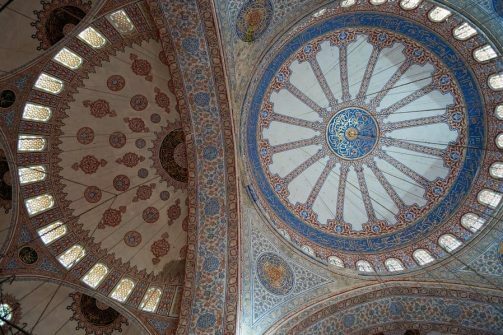 The interior domes are intricately tiled, painted and decorated with verses from the Koran and the sayings of the prophet Muhammad. We padded across the carpeting in our socks, necks craned upwards. Softly coloured rays of light filtered on to us through the 260 stained-glass windows. When: Open daily from 09.00 till 1 hour before dusk. Plan your visit to arrive mid-morning as the mosque is closed half an hour before until half an hour after prayer time – 90 minutes in all. Prayers happen five times a day with the first call to prayer at sunrise and the last one at dusk. Avoid visiting a mosque within half an hour after the ezan is chanted from the Mosque minarets. On Friday the doors are closed at 11am and open again an hour after noon prayer. Entry: Free but donations are gratefully accepted. Hi TB! I’m thinking of going to Istanbul for my birthday, but am a bit overwhelmed by the size of the place, and don’t know where to start. Which area would you recommend I stay in, and do you have any hotel tips? Hi RF! 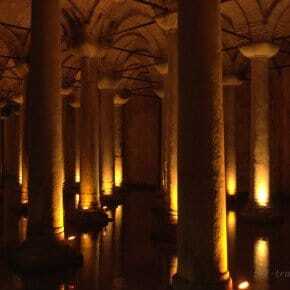 Istanbul is huge but a really good place to base yourself is in the Sulthanamet which is near to lots of top sights. We stayed at the Yasmak Sultan Hotel, Ebusuud Caddesi http://www.hotelyasmaksultan.com/ – think we paid around 90 euros per night incl breakfast at beg of Oct 3 years ago. 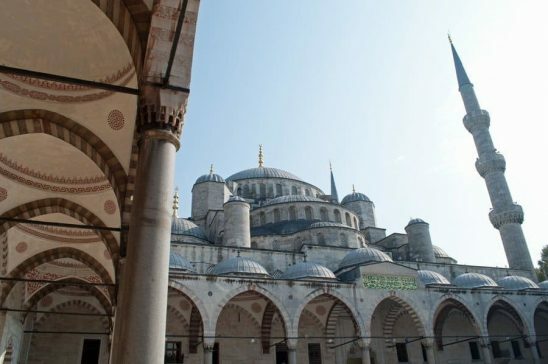 It’s a small hotel with a fab rooftop breakfast restaurant and in a great location with Topkapi Palace, Blue Mosque, Ayer Sofia, Basillica Cistern, Spice Bazaar and Grand Bazaar all within walking distance – I’d stay there again. When are you going? Thanks for the info! Unfortunately, Kat’s decided she doesn’t want to go there as she thinks it’s unsafe. I’ve tried to persuade her otherwise but she’s having none of it. We’ll be off somewhere in early Nov but are running out of options now! No worries – lots of other cities to choose from though. Look forward to reading about where you decide on ? Your photos are absoltely beautiful! I also love all the historical detail you have included. Thanks! I echo the other comments and say that these photos are really beautiful! There have never been to Istanbul, but I admit this with your post, the desire to go there is so much. History, art, culture, beauty of the country … all wrapped up in these beautiful photos! My passion for travel increases more and more and I admit that your blog is inspiring me to my next destination! 🙂 Thanks for your shares! it’s nice to see the beauties of the world. 🙂 Kisses! I have never been to Istanbul but I would love to go sometime. These photos are amazing as, I am sure, the buildings are in real life. 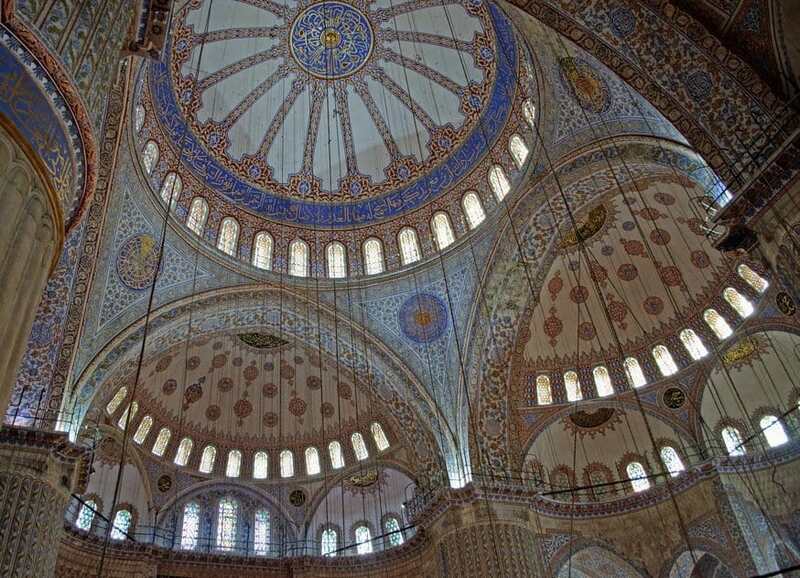 I love the Blue Mosque. 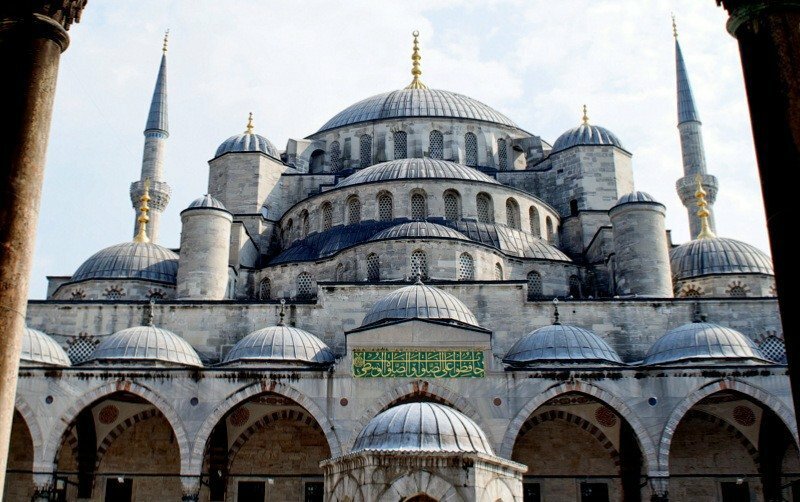 I visited Istanbul on my honeymoon last year, and was simply awestruck by the beauty and the history in the city! We stayed 10 days. Working on my own post on Istanbul as well, in fact. You were so lucky to have 10 days there! We had 3 so I’d love to go back. Will come and check out your Istanbul post. The decoration is just amazingly intricate isn’t it? I only had a couple of days in Istanbul but loved it – must go back and pinch your Turkey itinerary as it looks fantastic! Lovely pictures. Especially those of the roof showing so many different shapes and designs. 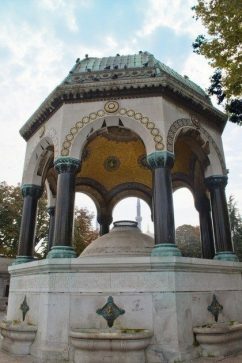 Thank you Chrisstov – the ornate decoration inside was so beautiful. 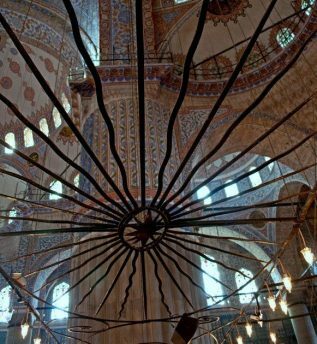 Stunning images of Sultanahmet mosque Suzanne! Truly a masterpiece isn’t it? 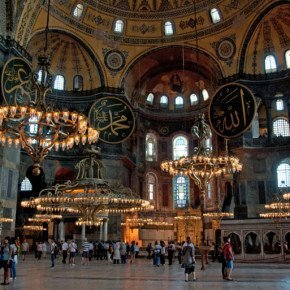 It’s one of the most incredible buildings I’ve visited – Aya Sofia is another! This brings back some memories of Istanbul from my trip last January. 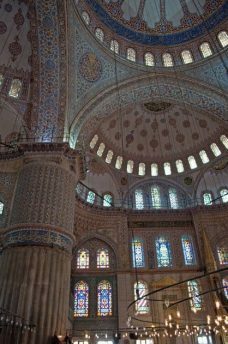 I loved the interior of the Blue Mosque, but the exterior was as wonderful as how it looked like from the inside. Truly a magnificent work of art. Wow. 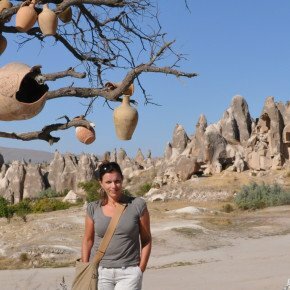 Istanbul was on my 2013 list (I probably won’t make it!) Beautiful pictures you took. 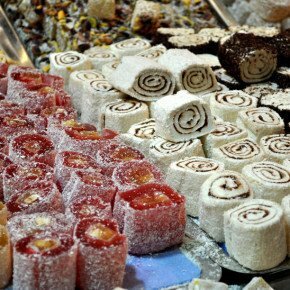 Makes me looking forward to my trip to Istanbul.